High net worth individuals (“HNWIs“) around the world have traditionally regarded Switzerland, London and New York as the main global wealth management hubs. However, over the last 5 years, Singapore is increasingly regarded by such HNWIs as a serious alternative to these traditional centres. In 2011, assets under management by Singapore-based managers have reached 1 trillion US dollars. This article briefly highlights the key factors making Singapore a rising jurisdiction amongst HNWIs for the setting up of trusts for their wealth management purposes. Picture Singapore Skyline, courtesy of Nick Socrates Wiki Commons. Robust Regulatory Regime: Singapore trust law is based substantially upon English trust principles. The principal statutes governing trusts that are most relevant to the private banking and wealth management industry are the Trust Companies Act1 and the Trustees Act2. The Monetary Authority of Singapore (“MAS”) is the regulator of trust companies under the TCA, and supervises the complementary activities of trust services, private banking and wealth management in Singapore. The TCA imposes mandatory licensing for all corporations that carry on or hold themselves out as carrying on any “trust business”3 in Singapore. The licensed trust company is required to appoint at least two resident managers with certain minimum credentials and who must be approved by the MAS after a “fit and proper” test to ensure their suitability for the role. (a) Reservation of power permitted: Section 90(5) of the Trustees Act expressly provides that no trust or settlement of property on trust shall be invalid by reason only that the settlor reserves certain powers to himself. The powers concerned are those of investment or asset management. (b) Promotion of Singapore trusts to foreigners: Under the Trustees Act, a person who is a non-Singapore citizen nor non-Singapore domicile is excluded from forced inheritance and succession rules, provided the trust is governed under Singapore law and the trustees must be resident in Singapore. This would allay fears by foreigners about the enforceability of such trusts in Singapore due to forced heirship rules in their home jurisdictions. (c) Rules against perpetuities addressed: Under Section 27(2)(b) of the Trustees Act, the validity of a trust extends to 100 years unless a shorter period is specified in the trust, in order to address the rule against perpetuities for trusts. Confidentiality: Singapore has enacted comprehensive secrecy and confidentiality provisions to the Banking Act, Chapter 19 of Singapore (“Banking Act”)4 and the Trust Companies Act5 to offer protection to the personal information of banking clients and settlors and beneficiaries of trusts. That said, these secrecy laws are subject to Singapore’s commitment to assist the international community in combating against money laundering, terrorism financing and tax evasion. Friendly Tax Environment: Singapore has a territorial tax system (only Singapore-sourced income is subject to Singapore income tax) and only taxes foreign-sourced income upon its remittance (or deemed remittance) into Singapore. Capital gains are not subject to tax in Singapore and estate duty was abolished in 2008. Singapore’s highest personal income tax rate is 20% whereas its corporate tax rate is flat at 17%. In addition, Singapore has an extensive network of double taxation agreements with over 70 jurisdictions. Qualifying Foreign Trusts (“QFTs”), which are trusts created in writing where the settlor and beneficiaries are neither citizens nor residents of Singapore or are foreign companies, enjoy attractive tax exemptions. To enjoy the tax exemption, the QFT must be administered by a Singapore licensed trust company. Open Economy and Sound Economic Policies: Singapore’s greatest competitive advantage is the openness of its economy. It has been regularly rated as one of the world’s freest economy, and easiest jurisdiction to carry on business by the World Bank. There is no exchange control, and the exchange rate of the Singapore dollar is managed by MAS, against a basket of currencies of its main trading partners, with the objective of keeping inflation low and maintaining the purchasing power of the Singapore dollar. Global financial institutions (including private bankers) and fund managers are attracted to Singapore due to its competitive tax incentives for the financial and wealth management industry. The wealth management industry in Singapore continues to be in an exciting phase of growth, notwithstanding current global economic uncertainties. Singapore has set its sights on attracting the world’s wealthiest to its shores. With its open economy, well-defined legal and regulatory framework, and tax neutrality, Singapore is well positioned to be the premier wealth management hub in Asia, acting as the gateway for the world to tap Asian investments and to the world for Asian investors. 1 Chapter 336 of Singapore (“TCA”). 2 Chapter 337 of Singapore (“Trustees Act”). 3 “Trust business” is defined widely to include acting as trustee for an express trust, administering an express trust, creating an express trust, and arranging for any person to act as a trustee for an express trust. 4 Under Section 47 of the Banking Act, a blanket prohibition exists against disclosure of “customer information” by a bank (or any of its officers) to any other person except as expressly provided in the Banking Act. 5 Similar provision prohibits disclosure of information regarding a “protected party” (which is defined as, in relation to a trust company, a trust for which the trust company provides trust business services and includes the settlor and beneficiary under the trust) by a licensed trust company (or any of its officers) to any other person, except as expressly provided in the TCA. According to Bloomberg news; Singapore topped Hong Kong as the most desired place in Asia for so-called mobile millionaires to reside, with quality of life cited as the main attraction, a RBC Wealth Management (RY)survey showed. Almost a third of the millionaires in Asia who live, work or spend more than half their time outside their countries of origin prefer Singapore, while 24 percent pick Hong Kong, the second most popular in the region, RBC and The Economist Intelligence Unit said in a joint research report yesterday. Singapore topped Hong Kong as the most desired place in Asia for so called mobile millionaires to reside, with quality of life cited as the main attraction, a RBC Wealth Management survey showed. Real estate led the list of preferred assets for the internationally mobile wealthy, according to the survey, which showed 23 percent of those in Singapore reporting a “high propensity” for property investment, compared with 7 percent in North America. The island’s home prices climbed to a record in the third quarter, prompting the government to restrict home loans and cap property development. Eduardo Saverin, co-founder of Facebook Inc., moved to Singapore in 2009, and Jim Rogers, chairman of Rogers Holdings, relocated there in 2007. “Singapore always has this quality as a safe haven, not just for your money, but also for your family,” said Wai Ho Leong, a senior regional economist at Barclays Plc in Singapore. For mobile millionaires who moved to Singapore, 89 percent ranked quality of life as important and 83 percent cited the country’s political stability as important, the survey showed. Infrastructure and educational opportunity were also given as reasons to live there. Singapore posted a 14 percent increase in millionaire households to 188,000 last year, when the Asia-Pacific region countered a decline in wealth in Western Europe and the U.S., according to a Boston Consulting Group report published May 31. The proportion of millionaire homes in the city was 17 percent, the highest in the world, followed by Qatar and Kuwait, according to Boston Consulting Group. Singapore has a population of 5.3 million, of which about 2 million are foreigners. “High net worth individuals with global outlooks for their businesses and families are choosing Singapore to live and invest in,” Barend Janssens, the Singapore-based head of RBC’s wealth-management unit for emerging markets, said in a statement. The city-state is grappling with the elevated inflation that comes with years of economic growth and population expansion on an island smaller than New York City, with rising demand fueling record property and car prices. In the three months ended Sept. 30, the island’s private residential property price index rose 0.6 percent to a record 208.2 points, according to government data. In prime districts, apartment prices gained 0.2 percent, compared with a 1 percent increase in the suburbs. The Monetary Authority of Singapore told lenders on Oct. 5 to restrict home-loan maturities “to curb continued upward pressure on residential property prices,” in an attempt to avert a housing bubble. The government said in September it plans to cap the number of homes that can be developed in suburban projects as it seeks to curb the increasing trend of so-called shoebox apartments. The cost of a permit to own a small car for 10 years rose to an unprecedented S$78,523 ($64,300) on Dec. 5 from S$46,889 at the start of the year. That excludes the cost of buying a car. The government auctions limited vehicle permits to control congestion and pollution. Hong Kong is the best place to do business, according to data compiled by Bloomberg. The city of about 7 million people secured the top position in an index based on six criteria including the degree of economic integration and labor costs. 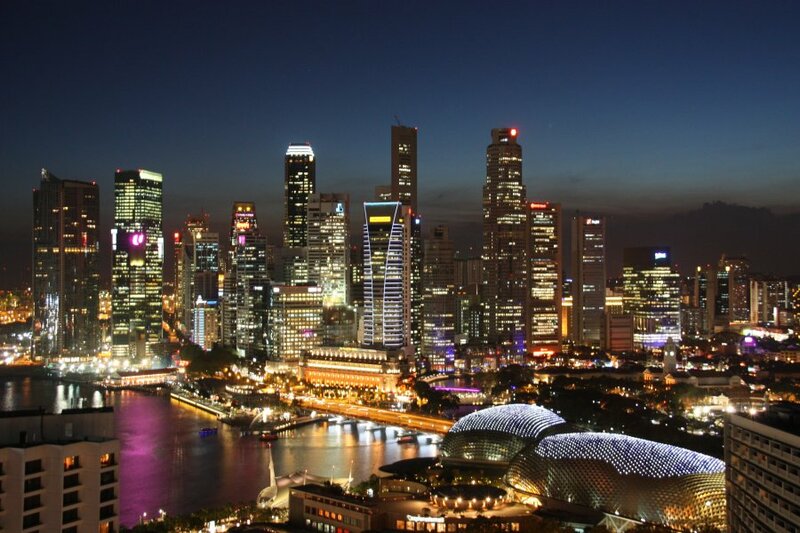 Singapore ranked ninth in the index published in March by Bloomberg Rankings. Hong Kong acts as the gateway to China, the world’s most populous nation, with free-market policies and low corporate taxes. The World Bank ranks Singapore and Hong Kong top in its gauge focused on the ease of doing business. The Washington- based Heritage Foundation has named Hong Kong the world’s freest economy for 18 successive years. See the full article from Bloomberg here. Hong Kong has once again topped the Fraser Institute’s Economic Freedom Index, which measures the degree to which the policies and institutions of countries are supportive of economic freedom. According to the report, Hong Kong scored highly across all of the five categories which are used to calculate index scores, including size of government, legal structure and security of property rights, access to sound money, freedom to trade internationally, and regulation of credit, labor, and business. Hong Kong has topped the Fraser Institute’s 141-country ranking every year for the past three decades. This year, Singapore, New Zealand, Switzerland, and Australia were placed after Hong Kong in the top five. The United States experienced one of the largest drops in economic freedom, according to the report, falling to 10th place overall from sixth in 2010. Much of this decline is attributed to higher spending and borrowing on the part of the US government, and lower scores for legal structure and property rights. “The link between economic freedom and prosperity is undeniable: the countries that score highly in terms of economic freedom also offer their people the best quality of life,” said Fred McMahon, vice-president of international policy research at the Fraser Institute, a Canadian public policy think tank. Commenting on this year’s index results, Hong Kong Chief Executive Donald Tsang remarked that economic freedom was “part of Hong Kong’s DNA”. “In such testing times, it is important for an externally oriented economy such as Hong Kong to remain true to our philosophy. That means strong fiscal discipline, low taxes, open markets, free flow of information, goods and capital, clean government and a level playing field for business,” Tsang said in a speech September 20. Finance Minister, Tharman Shanmugaratnam, delivered Singapore’s budget statement for the 2011/12 fiscal year on February 18, and announced tax benefits to households and businesses totalling some SGD 13bn (USD 10.2bn). Shanmugaratnam said that the government’s long-term aim is to raise incomes by 30% in real terms over the next ten years by growing the economy, and helping businesses to invest, restructure and developing skills, while also introducing measures to expand support for lower and middle-income Singaporeans. He pointed out that Singapore’s economy had done exceptionally well in the past year. After two weak years in 2008 and 2009, when growth was close to zero, its gross domestic product (GDP) grew by a record 14.5% in 2010, and is forecast to grow by up to 6% this year. Due to the improved economic growth, the originally expected budget deficit of SGD 3.0bn, or 1% of GDP, in 2010/11, has been transformed into a much lower deficit of SGD 0.3bn, or only 0.1% of GDP. Shanmugaratnam was therefore able to announce that, in 2011/12, companies will receive a 20% income tax rebate, capped at SGD 10,000, or a small and medium-sized enterprises (SME) cash grant of 5% of a company’s revenue, capped at SGD 5,000. Companies will automatically receive the higher of the tax rebate or the grant when Inland Revenue Authority of Singapore assesses 2011/12 tax returns. To further encourage pervasive innovation and raise productivity efforts, the productivity and innovation credit (PIC) scheme will be simplified and enhanced. The amount of tax deduction or allowance will be increased to 400% (from 250%) of research and development (R&D) expenditure, for the first SGD 400,000 (increased from SGD 300,000) spent on each qualifying activity. PIC benefits will also be made available to R&D made abroad; businesses will be allowed to combine the SGD400,000 expenditure cap per year for 2013 to 2015 into a new ceiling of SGD 1.2m over the three years; and there will be an enhanced cash conversion option where taxpayers can opt to receive, in lieu of tax deduction benefits, a cash payout of 30% of the first SGD100,000 of qualifying expenditure, up to a maximum of SGD 30,000. In addition, Shanmugaratnam is to simplify and reduce the taxation of foreign income, so as to support companies that are globalised and earning a larger share of their income overseas. Foreign tax credit (FTC) pooling is to be introduced to give businesses greater flexibility in their claim of FTCs, reduce their Singapore taxes payable on remitted foreign income (FI), as well as to simplify tax compliance. Under the FTC pooling system, FTC is to be computed on a pooled basis, rather than on a source-by-source and country-by-country basis for each particular stream of income. The amount of FTC to be granted will be based on the lower of the pooled foreign taxes paid on the FI and the pooled Singapore tax payable on such FI. This will take effect from the 2012 assessment year. Shanmugaratnam then said that, while Singapore is making good progress to becoming a location of choice in Asia for global companies as well as a launch-pad for Asian enterprises to globalize, he has made other tax changes in strategic business sectors to enhance its overall competitiveness as such a hub. For example, to facilitate access to a wider range of funding sources for their lending business and strengthen Singapore’s position as a regional funding centre, enhancements will be made to the withholding tax exemption (WHT) exemption regime for banks, finance companies and investment banks with effect from April 1, 2011. WHT exemption will be granted on interest payments made to all non-resident persons (including funding from non-bank sources, such as hedge funds and insurers). With effect from June 1, 2011, existing maritime incentives will be streamlined and enhanced. New tax benefits, such as certainty of WHT exemption for interest payments on loans to build or buy ships, will be introduced to further entrench international ship operators and encourage the growth of the shipping-related services sector in Singapore. There will also be a package of individual income tax benefits for all Singaporeans. All resident individual taxpayers will be given a one-off personal income tax rebate of 20%, capped at SGD 2,000 per taxpayer, in 2011/12, and a new personal income tax rate structure will take effect from 2012/13. Marginal tax rates will be reduced for the first SGD 120,000 of chargeable income. While all taxpayers benefit, middle-income earners will enjoy the largest percentage reduction in taxes under the new rates. Shanmugaratnam disclosed that the government will continue to review Singapore’s top personal income tax rate, but saw no pressing competitive need for it to be reduced at present. After factoring in the various tax and other measures announced in his budget, he still expected a basic fiscal deficit of only SGD 2.2bn, or about 0.7% of GDP, in 2011/12. If you establish a private foundation, and are careful with how you use Swiss bank accounts, you would avoid repeating Liliane Bettencourt’s problems. The story of L’Oreal heiress Liliane Bettencourt fortune have it all to provoke a scandal ; A L’Oreal heiress gives EUR 1.3 billion to a friend, causing an investigation, here hiding of secret funds in Switzerland, and here attempt to move the money to Singapore and Uruguay, as well as a jealous daughter and more……. Read the story here. If you understand French you can listen to the secrets tapes here. The lesson from Liliane Bettencourt’s case is be careful with how you use Swiss banks and get distance to your fortune by using foundations and trust’s in selected jurisdictions. Contact us if you need assistance to establish a private foundation or advise regarding the use of Swiss bank and other international banking centers.